Hot off the press! 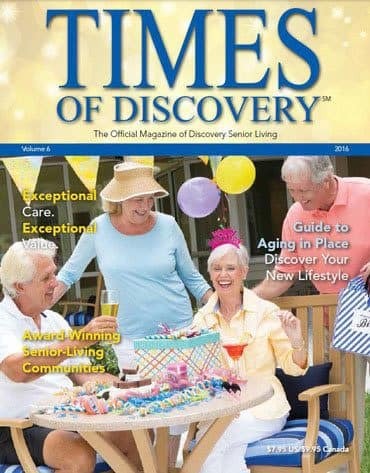 Be the first to order your FREE digital Times of Discovery magazine, the definitive guide to Discovery Senior Living’s award-winning communities and lifestyle offerings. Discover a world of exceptional senior living as you explore our exclusive lifestyle programs, including Sensations dining, Celebrations activities, Dimensions wellness, Connections transportation, Impressions housekeeping, and Expressions concierge services. It’s all about you as you indulge in the benefits offered at our world-class rental communities, offering the best value in senior living. The 90+ page guide features information on choosing the right living option for your needs as well as exploring the amenities and services you want in your new home. Please also enjoy special editorial features highlighting the remarkable lives of some of our special residents.